UBA was the lead spender in the category for 2018. The general trend witnessed over the years of a steady growth in the use of digital format was also observed in this category. 2018 Telco spend witnessed a 10% decline from N6.1bn in 2017. Within 2018 there was a 56% drop in spend between Q1 & Q2 which was majorly attributed to by the drop in hoardings by GLO and 9Mobile. In H2, 2018 GLO increased activity on OOH and they accounted for the 18% increase in spend between Q3 & Q4, acquiring major LEDs in the key cities of Lagos, Abuja and Port Harcourt. 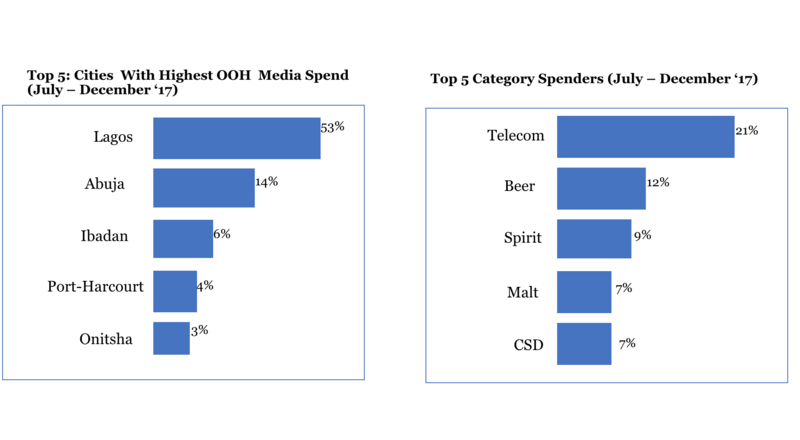 From the spend pattern observed in Q4 2018, we project that there would be an increase in TELCO spend for 2019 as brands compete for a greater share of the market. We are seeing an increase in consideration and spend in favour of DOOH over static OOH formats. The use of digital formats although at a higher cost creates greater flexibility in campaign deployment, opportunities for more targeted advertising and opportunities for integration of ATL communication with sales promotions and experiential activations. Until these opportunities are harnessed into competitive advantage by brands, the debate on the justification on the cost and use of DOOH will persist. The total spend on OOH for the Milk Category in the 3rd Quarter of 2018 was N246m. 75% of this amount was spent in Lagos with LED boards taking up 63% of the total amount spent on OOH in the Milk Category. Summary of July � December 2017 Report.